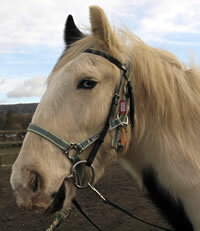 George is a 15.1hh piebald cob. He is not a fast mover, but is 100% dependable and much loved by many of our riders. George has very distinctive looks with a blue eye and a smart moustache!